The Pakistani doctor involved in the US search for Osama Bin Laden has been quoted as saying he was unaware of his role in the al-Qaeda chief's death. 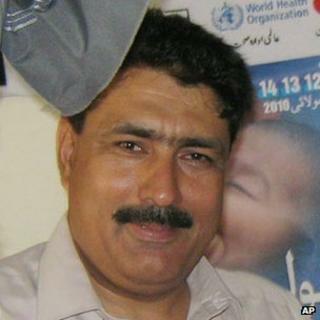 Shakil Afridi reportedly told Fox News from jail in Peshawar that after the 2011 killing he had been kidnapped and tortured by Pakistani intelligence. He also reportedly said the ISI agency regarded the US as its worst enemy. But Dr Afridi's lawyer told the BBC he was not confident about the authenticity of the interview. Samiullah Afridi said his client was kept under "very strict security", and was even prevented from seeing his family and lawyers for months at a time. "How a journalist can set up an interview with him in jail is beyond my comprehension," the lawyer said. The Fox News interview raises many questions. Dr Afridi's lawyer wonders how a journalist could set up a phone interview with him in a maximum security prison cell. A jail official speculates that if anyone could smuggle a phone to him, it could only be one of the close relatives that visited him in jail twice in August. But many ask why the relatives - a brother, two sisters and a cousin - would undermine their own rather hard-won right to meet him periodically after an initial ban? The question is did Dr Afridi actually say the things he's reported to have said in the interview? If so, why, given that this could translate into further problems for him and his family? One explanation is that Dr Afridi believes he's in a desperate situation, and that keeping the story alive may be his best defence. The doctor is alleged to have used a fake hepatitis B vaccination campaign to try to obtain DNA samples of Osama Bin Laden's family. He was sentenced to 33 years in jail in May for funding and supporting a militant group, but correspondents say it is generally acknowledged he is being punished for helping the US Central Intelligence Agency (CIA). The interview was published on the eve of the 11th anniversary of the 9/11 attacks on the US, and came as current al-Qaeda leader Ayman al-Zawahiri confirmed the death of another senior figure in the network, Abu Yahya al-Libi, in a US drone strike in Pakistan's tribal areas earlier this year. Meanwhile, Zawahiri's brother Mohamed has told CNN he is prepared to negotiate peace between the West and Islamists. Zawahiri, who spent 14 years in jail in Egypt, is said to have the respect of the new Egyptian government but claims to be ideologically close to his brother. Speaking from Peshawar Central Jail, Dr Afridi said he had not realised that the CIA was targeting Bin Laden. "I didn't know about a specific target apart from the work I was given to do," he told Fox. "I was aware that some terrorists were residing in that compound, but I didn't know whom. I was shocked. I didn't believe I was associated with his killing." He said that the CIA had advised him to flee to Afghanistan. However, he was scared to cross the volatile border region and did not think it was necessary to escape because he did not consider himself to be involved in Bin Laden's death, he said. Dr Afridi was arrested at a checkpoint at Hayatabad on 22 May last year, 20 days after Bin Laden's death. After this he says he was blindfolded for eight months and handcuffed for a year in a prison beneath the ISI headquarters in Islamabad. "I had to bend down on my knees to eat with only my mouth, like a dog," he said. During interrogations he was tortured with cigarette burns and electric shocks, he said, as the ISI rebuked him for helping the US find Bin Laden. "They said: 'The Americans are our worst enemies, worse than the Indians,'" he added. Dr Afridi also said fellow inmates had told him that they had been advised to make things up to prevent interrogation by visiting CIA officers. However, independent analyst Shaukat Kadir told the BBC that while it was possible to find people in the security services with such views, they were in a minority. "That doesn't mean the bulk of the people feel the same way," he said. Dr Afridi said that he himself was "proud" to work with the CIA and would help the US again, despite the torture and psychological abuse he said he had suffered. "I have a lot of respect and love for your people," he said. There has been no official response to Dr Afridi's allegations, but the Pakistani authorities have always insisted that they treated him the way any country would someone found working for a foreign spy agency. In his comments to the BBC, Dr Afridi's lawyer said that if the comments were genuine they would "certainly add to [Dr Afridi's] difficulties in coming days". But he said neither he nor Dr Afridi's family could confirm the interview had taken place or offer any comment on it. Bin Laden's killing created a crisis in relations between the US and Pakistan, whose government was seriously embarrassed as it emerged that the al-Qaeda leader had been living in Pakistan. Islamabad felt the covert US operation was a violation of its sovereignty. Both US Defence Secretary Leon Panetta and Secretary of State Hillary Clinton have said Dr Afridi's arrest was a mistake, and called for his release.